Mountain bike race genres shift in popularity at a slightly slower frequency than trending colorways. Which is to say, shifts are frequent, but a positive for athletes. Unlike road or cyclocross racing that generally maintain their original forms, mountain competitors can try different disciplines, chase sponsorship cash as it jumps genres, and refresh their love for the dirt by transferring their skills to new challenges. Former 4X (four cross) World Champion Katy Curd is a living example of athletic adaptability and perseverance. 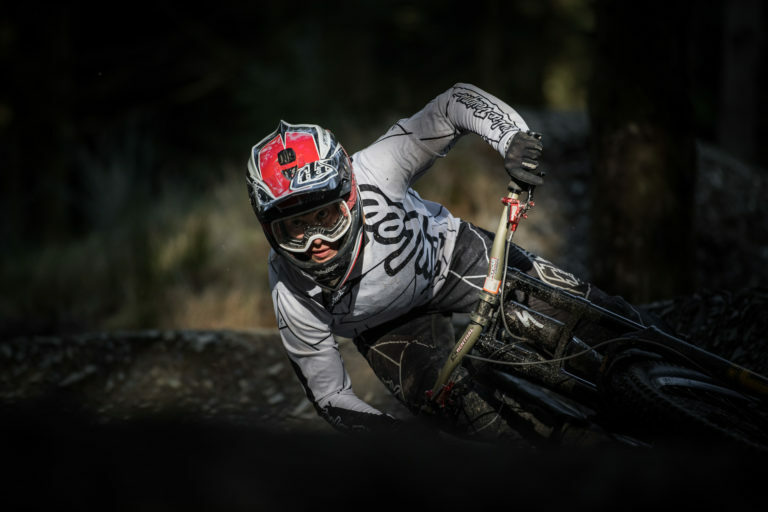 She slingshot herself to the top of international 4X leaderboards, scrubbing jumps alongside three other talented ladies, and when 4X wained in popularity and prize money, she took to downhill racing. Katy has endured shifts in the sport that saw a lot of riders hang up their bikes for a day job, alongside some significant injuries that required her to deeply refocus and recover. 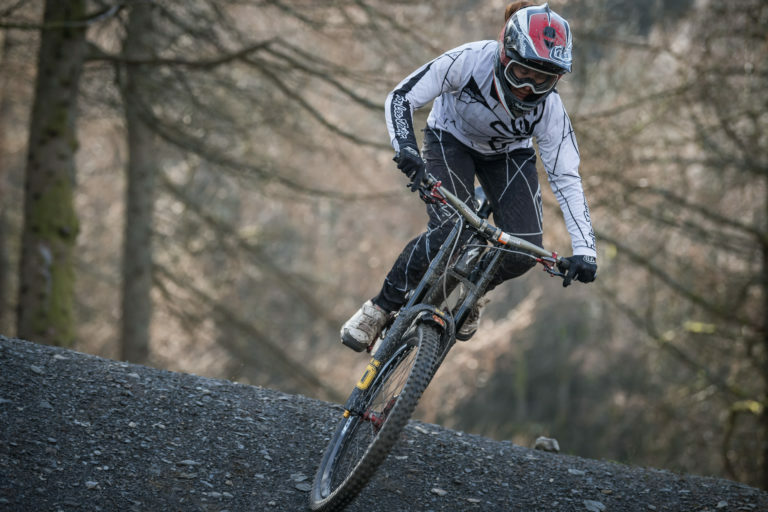 On the other side of some career adversity, today Katy’s palmarès include a silver medal from Junior World Champs, reigning UK Downhill National Champion, winner of several World Cup downhill podium positions, and a European Championship title. To keep the calendar packed, she works a second job as a full-time professional skills coach. We recently spoke with Katy about her developing athletic career and plugged in a couple of questions from Singletracks readers. To get an idea of how much support an athlete has received, and who has encouraged them to pursue a taller challenge in the sport, I like to start off by asking how they were motivated to pedal for a living. Curd’s first fire was stoked by playing bikes with good friends. Curd has earned some massive achievements since winning a silver medal in the Junior World Champs, and she isn’t grabbing the brakes any day soon. 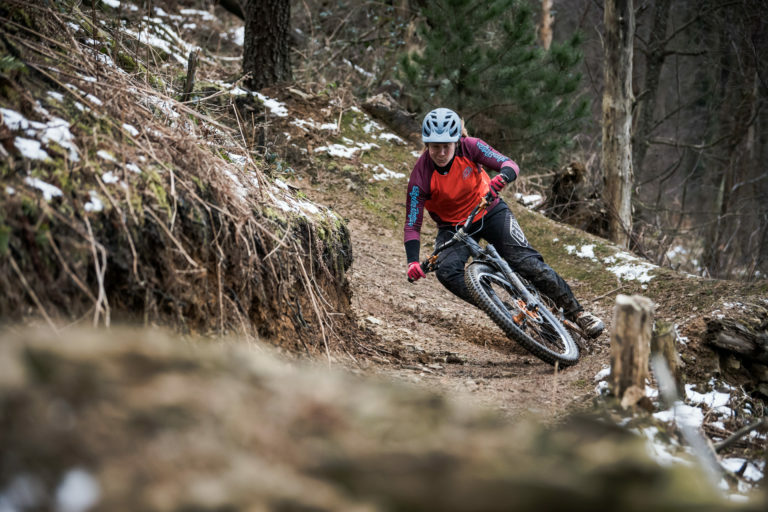 Her other accolades include a 4X World Championship win in 2014, multiple 4X National Championships in the UK, a UK National Downhill Championship, and multiple top-ten World Cup downhill finishes in 2018. Curd is part of a living timeline for the gravity-BMX discipline of 4X. Though fewer pro riders are lining up to those four tall start gates today, the spectator-friendly sport isn’t entirely lost. 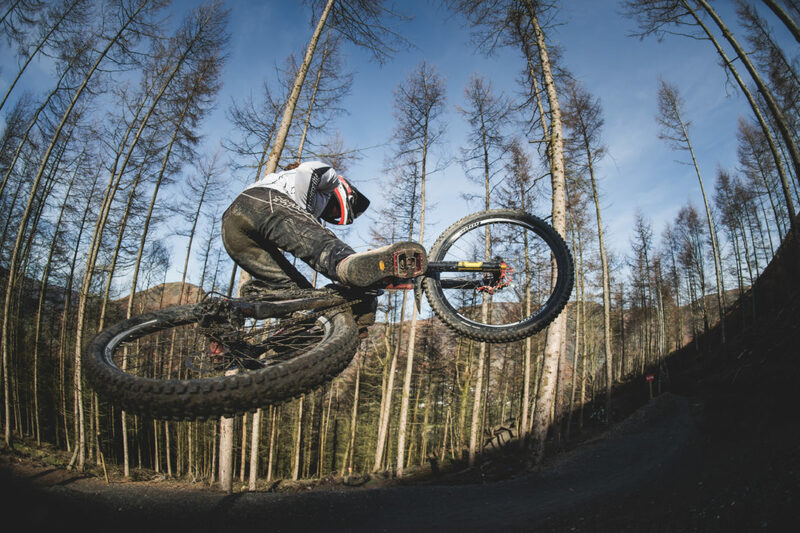 With the looming World Cup and British National downhill series a blink away, Curd is training hard for a full schedule of full-send and is racing the entire UK National Downhill and World Cup Downhill series. Even though she’s a pro, Curd still has rough days on her bike. A Singletracks reader wanted to know how pros like Curd get back on track. Another reader wanted to know if Curd has any race-preparation rituals. In Curd’s coaching business she helps clients learn the techniques to build their skills, overcome fear, and embrace challenges. On fear specifically, Curd says that a steady build-up approach works best. 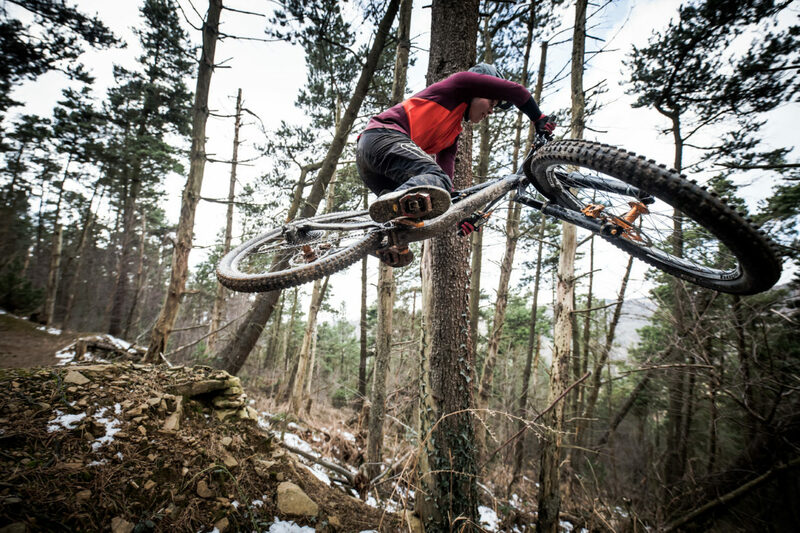 Curd also has skills tips for riders who want to take their mountain biking to the next level. 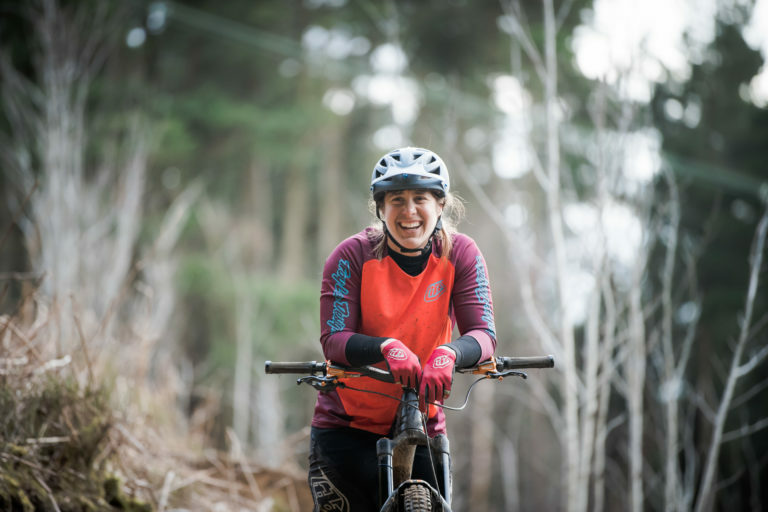 With a long list of trail centers and bike parks dotting the British countryside, we asked Curd where her favorite tracks are in the UK — and in her travels around the world. Another reader asked what a perfect day on the bike would look like for Curd. 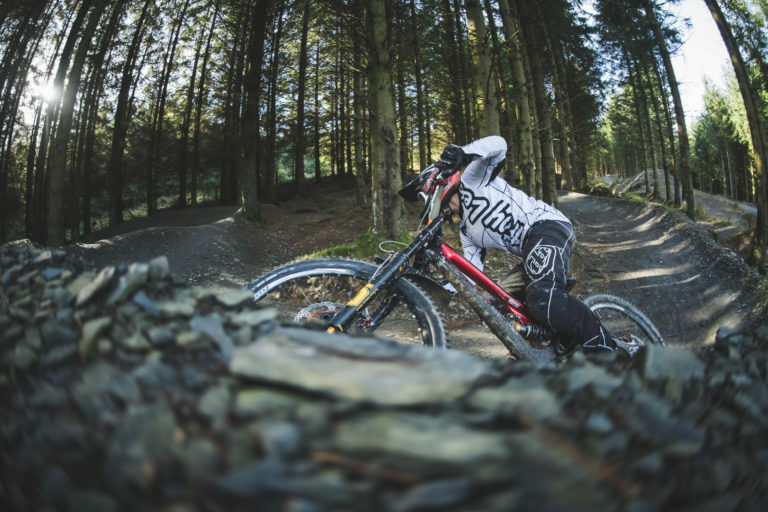 “A perfect day for me would actually be a good morning on the DH bike at some of our local steep tracks. They are short but good fun. Then an afternoon and evening on the dirt jumps with all my friends and a BBQ. My dirt jump bike is where I started out and it still brings me the most joy out of all my bikes. Finally, what does a world-class athlete like Curd do off the bike? Follow along with Curd’s race season here. Readers can find more about her coaching on her website. Remember when Tim Ferry beat Jeremy McGrath in the L.A Coliseum?